‘Waltz with Bashir’ is not a relaxing cartoon movie. It is on the contrary a very disturbing political animation feature about a war, a massacre, and most importantly about denial and guilt. Artistically, the movie is a masterpiece. The reconstruction of the natural and urban landscape of 1982 Lebanon, and its adaptation into animation frames is a total success. As a Lebanese I was amazed by the capacity of writer/director Ari Folman (himself ex-Israeli soldier) to recreate the context and to adapt it with such precision. On this specific point, he succeeded where the expert in war scenes reconstruction Steven Spielberg (Cf Saving Private Ryan) failed in ‘Munich’. 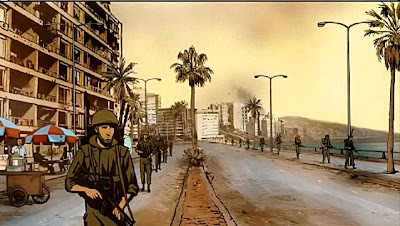 In that movie, Spielberg’s vision of Beirut in 1971 when trying to recreate the scene of the Israeli commando operation in Beirut is at best inaccurate, relying on generic stereotypes of Arab cities. But Waltz with Bashir is not a historical movie. It will never be a piece of valuable archive on the Sabra and Shatila massacres in 1982 or even on the Israeli invasion of Lebanon that same year. Folman’s work does not contradict agreed historical facts, nor does it attempt to twist reality to fit the Israeli version of events. There is nothing misleading in the movie, however, it fails to draw on the whole political context of the invasion and the massacre. For example, Ariel Sharon, the architect and mastermind behind the 1982 invasion has a minor appearance of less than a minute. I can assume that finally Ari Folman did not set up to make a historical and factual movie that would be cited as a reference. What is sure is that he wanted something else from his movie. His message resides in the relation between guilt and denial within the Israeli society, regarding the massacre of Sabra and Shatila. The guilt Ari Folman himself experiences as an ex Israeli soldier who took part in the invasion of Lebanon in 1982 is shared by an entire generation of Israeli soldiers. Even if Israel as a State washed its dirty hands with the Kahana Commission of Inquiry in 1983, which found Sharon indirectly responsible for the killings and prompted his resignation as defense minister costing him years in the political wilderness; this isn’t enough for Folman. In the movie, through the individual accounts of his former comrades in arms, he tries to understand why Israel did not stop a massacre while it had all the power to do so. The difficulty in answering that question reveals other more personal open wounds for these men who, for more than two decades, found refuge in a state of denial. In that sense, ‘Waltz with Bashir’ is a remarkable work on the Israeli collective memory and targeted directly at an Israeli audience. It acts as a motivator to reflect on 60 years of often very shameful History. The Movie is also uniquely brave, and goes where few Israeli or Jewish box office movies have, in comparing the images of Sabra and Shatila to the ones of the Prague Jewish Ghetto during the Second World War, breaking the Zionist myth that no suffering can equal what Jews suffered under the Third Reich. It is not surprising ‘Waltz with Bashir’ won 10 awards including Best Foreign Independent Film at the British Independent Film Awards, and three nominations including the prestigious Palme d’Or at Cannes Film Festival. Its success raises the issue that Israeli society finds itself ahead of the Arab World in working on the collective memory of the Arab Israeli conflict. This part of History also belongs to us, and it is maybe time we take a step forward in facing our inner devils. It is painful I agree. But very interesting in terms of watching where the israeli soldiers stand after all that time. Unfortunaltely, we did not yet see an evaluation from any kind coming from the lebanese forces, the real perpetrators of the massacre!... And there is dfntly a strong need for a structural work on the collective memory in our countries if we don't want to keep on repeating the same mistakes. "...work on the collective memory in our countries if we don't want to keep on repeating the same mistakes." I agree wholeheartedly and have written about this on several occasions. The Lebanese, in particular, play the collective amnesia game very well. The movie starts with an elaborate nightmare: The dogs running through the streets of an Israeli city. An abstract hallucination in the mind of one veteran.It ends with genuine archive images from the massacres of Sabra and Shatila. And for me the psychological journey between these two is essentially the one taken (or should be taken) by Israel and its soldiers. From an unease resulting supposedly from the guilt of shooting dogs and the discomfort of military life they soon spiral into the realisation that they were a cog in a well oiled machine,that in cold blood and intentionally massacred real innocent human beings. The mood of the move darkness at this point and so did the mood in the theatre. Does anyone know if the movie will be showing in Beirut? Abu Kareem - Can you expand on how the collective memory of the Lebanese is particularly selective? I'm very interested in your perspective particularly when we look at the broader picture which includes Syria, Jordan, and the Palestinians. I ask because it is my understanding massacres occured in abundance in Syria (Hama), Jordan, Iraq, and in Lebanon at the hands of surprise surprise Syrians and Palestinians. If my historic facts are skewed, I'd appreciate some enlightment. My wording perhaps gave the wrong impression that I think the Lebanese are the only ones with selective memories. My comment only reflects my personal experience living through many years of the Lebanese civil war. As for the second part of your comment, I am not sure how you deduced that from anything I said. Is it perhaps the fact that I am Syrian? I have long since stopped being partisan when it comes to Middle Eastern politics; I make excuses for no one. Now if your implication is that everyone BUT the Lebanese are to blame for the civil war, then we really don't have much to discuss. Abu Kareem - You're making assumptions that are not in my response to you. And since your personal experience of the war include the events of 1982 in Beirut, it is hard to imagine why I'd assume you're Syrian to begin with; especially when I list Syria, Jordan, and the Palestinian territories. Since your views are based on personal experience, the certitude by which you single out the Lebanese as being in denial puzzles me. I bring up the Palestinian Authority in terms of their contribution to the degradation of Beirut and more recently in the territories with the violence between Fatah and Hamas. I bring up the Syrians with regards to Hama. I bring up Jordan with regards to their treatment of the Palestinians. Therefore, it is fair to say, my comments where not Lebanon-centric, but I concur, you bring up a good point regarding the contributions of the Syrian government to the deterioration of Lebanon. I too had personal experiences in Lebanon at the hands of the Syrian army and Mr. Arafat's militias. I have yet to be singling out any people for anything. It's good to know you don't intend to single out anybody in the Middle East, though in the same token, it'd be nice if we cut the Lebanese some slack. Good to hear from you Marwan.I certainly agree the Lebanese are not worse than their neighbours in terms of denial, but they are not much better. I wonder in the context how you viewed General Aoun's visit to Syria. A case of selective Amnesia? I have lived in Lebanon much longer than in my native Syria and I want nothing more than for Lebanon to succeed and to achieve its potential. But the only way forward is for the Lebanese to go through a Truth and Reconciliation process similar to what happened in South Africa. The history of the civil war should be taught in school in an objective way and not pretend that it didn't happen as is currently the case. There should be a monument or some remembrance of ALL who died during these horrible years. I don't think the denial is on a personal level but at the institutional and government level. There has been a comission in place for 10 years looking into how to teach the history of the civil war and they have decided on nothing. As a consequence, the civil war is like a black hole in school books and students learn nothing about it except from their parents personal and necessarily one-sided view. Attempts, several years ago, to set up a photo exhibition about the war was blocked by the government. There are numerous other examples. None of what I said absolves Syrians, Palestinians, Israelis or Americans from culpability in Lebanon's troubles. But Lebanon is not a helpless political football kicked around by bigger nations. The negative outside influence is facilitated and made possible by the discord and disunity among the Lebanese. So, Marwan, I am always ready to cut the Lebanese people some slack but not (most)their politicians and their zuama. Joseph - Since returning to Lebanon Mr. Aoun has been working on scoring political points wherever and whenever the opportunity presented itself. The visit to Syria is a slap in the faces of the family members and friends of those who perished at the hands of his foolish policies. I suspect however those same individuals are either supportive of the March 14 alliance, distrust the two political alliances, or are simply dead or no longer in Lebanon. Of course those people disheartened with Mr. Aoun’s recent visit have not been given the opportunity to speak and share their pain (at least to the best of my knowledge). As I indicated earlier in many of my emails – where I’ve been dubbed a “Aoun man” or some ridiculous assignment of the sort – Mr. Aoun and his allies are the perfect opposition to the current government. The March 14 alliance is made out of politically incompetent businessmen formally friends of Syria or Israel, now foes to both; the March 8 alliance is made out of people who want you to forget their past to understand their current and future policies. Pick and Choose. To go back to Abu Kareem’s brilliant (in my opinion) last response to my email. Abu Kareem - you need to cut the Lebanese some slack for the reasons I’ve listed earlier – shortsighted, mafia and tribal like leadership with no sense of accountability, civic duty, rule of law, in other word governance. It’s all good, but how do you begin to address this problem? Is this another case of the chicken and the egg, what came first? Or are we still missing much needed maturity to reach above current mediocre leadership and bring to office men and women with stronger governance ethics and adherence to the law? Americans say all politics are local. To date in Lebanon any discussion about national reconciliation, credible historic counts, the rule of law has been toothless lip service at best. Before we ask ourselves why we can’t incorporate historic facts about our civil war into our school books let’s try to address if we are willing to and if we aren’t why. The problem with the national reconciliation lies with the fact that we haven’t healed. The civil war erupted in ’75, 33 years ago, 2 years before I was born. That was not long time ago. We also haven’t learned our mistakes so as to not repeat them. We haven’t learned because we are unwilling to adopt a common history book. We believe the actions of Lebanese Christians, Jews, and Muslims reflection their individual religious groups and not the country as a whole. We live in a constant state of conflicting identities. Perhaps the first step of getting out of denial is admitting denial there is, history will tell. This is a fascinating topic to me and I wonder if anyone took the time to research the topic of identity and views on history in Lebanon. Finally, thank you Abu Kareem for taking the time to respond. bravo Bachir for the article about the film. I'd like to add that upon seeing it I had a nervous breakdown (fiction has its way to the brain, a better way than documentary -"Massaker"- or essay): guilt, horror. A few Lebanese acquaintances told me afterwards that they appreciateed the film, but that it was one-sided, putting "all the blame on the Christian militia", "and then, not all the Christian community is to blame for the action of a militia group". I answered that I didn't care. Wondered when they had the TIME to step back and think about weights and balances upon viewing these images that did occur in reality. "did any of our parents react in any way, when the massacres oocured? Did they march and protest and shouted "not in our name"? Did they protest when Hobeika became a minister, saying: oh no, we don't want that criminal working for us? No? Well, we are ALL accomplices. Them, you, and I. Guilty and shameful. Basta". Mind you, I instinctively loathe the idea of Palestinians moving around with weapons in Lebanon, and any Communist ideal makes me suffocate, but damn it!!!!!!!! It is impossible to live blinded in 2cm square and in denial. That is, I believe, the specificity of a people (any people in the region) that has not acquired the position of citizenship. You have to feel you're a citizen if you want to engage, defend, and also: discover what's there, on the other side of that street. a-will acknowledge that the massacres were perpetrated by men with names like George and Elie who then went home to eat a mankoushe with their families as if nothing happened. b- and who feels genuinely sorry for what happened. This is not in defence of what the Palestinians or others did, but that is a circular debate anyway, and the film is about Sabra and Shatila, not the Lebanese war. Ans yes, the movie is one sided...it is the side of the regular Israeli soldier. That is the whole point! So any accusations of pro-Palestinian bias is misplaced. Joseph and Caroline - The broader question in my mind is a follows: Should this be a black mark in the history of Christian Lebanese or should this be a black mark in the history of Lebanese. The actions of the Bush administration falls back on all Americans yet in the Middle East in falls on religious factions. I think Abu Kareem's last response had it right. Your parents Caroline, reacted in a similar faction a Mohamad, Hussein, Kais, Haddassah would have reacted back then. It is true if we don't remember our past we are bound to repeat, but if we don't understand it, our apologies and efforts for national reconciliation would be lip service at best. A simple answer to your question Marwan is that my personal belief is that the Lebanese Christians who at the time overwhelmingly supported the Lebanese Forces should at least apologise for not even distancing themselves from the massacre or criticizing the perpetrators. It is no good diffusing responsibility when trying to deal with history and moving forward with reconciliation. The Lebanese wars saw a number of horrifying actions from all parties, which I hope one day will be dealt with appropriately and in context. In the Sabra and Shatila case the victim is known and so are the culprits. The movie doesnt actually point a finger and focuses on the Israeli perspective. The rest is up to us. I thought my point was beyond the movie. We beat this horse to death and we're still running in circle. Pretty high expectations you have for an ever shrinking segment of the Lebanese population, but again no one can accuse you of being inconsistent on this particular issue. Since this is your personnal opinion, let's leave it as that. نا أرى في تحميل مسيحيي لبنان مسؤولية هذه المجزرة مبالغة ما، لأننا نكون قد تعاطينا فقط مع الجزء الخاص بالحرب الأهلية. هذه المجزرة بالذات فيها قدر كبير من المسؤولية الإسرائيلية لا يمكن أن يمحوها تقرير لجنة كاهان التي تشكلت تحت الضغط الدولي والإسرائيلي الداخلي، كذلك من غير المنطقي النظر إلى الإسرائيلي باحترام لأنه انتقد نفسه، وهو بعد سنوات قليلة انتخب ارييل شارون مجرم الحرب (منذ كان في الوحدة 101 سيئة الصيت) رئيسا للوزراء. كذلك توجد مسؤولية دولية، حيث أن منظمة التحرير الفلسطينية لم تترك المخيمات دون حماية الا بعد تعهدات بحفظ سلامة هذه المخيمات تلقتها من الولايات المتحدة الاميركية والدول العظمى عبر موفدها آنذاك فيليب حبيب. وتوجد مسؤولية على عاتق القوى البنانية الأخرى (المسلمة يعني) التي غضت النظر عن المنفذ الفعلي للمجزرة وحصرتها بالياس حبيقة الذي تحوّل بعدها بسنوات معدودة الى بطل سلام الاتفاق الثلاثي وحليف سوريا المسيحي الأبرز. كما إن تحميل ما يسمى المجتمع المسيحي اللبناني عبء المجزرة فيه نوع من تناسي المسؤولية الحقيقية للميليشيا والقيادة السياسية. سنوات طويلة مارستها المؤسسة الدينية المهيمنة والقوى السياسية والإعلام جعلت الخوف لدى المسيحيين هو العقيدة الرسمية، والذين نفذوا المجزرة كانوا تحت هذا الغطاء الأيديولوجي الذي من الظلم تحميله للمواطنين العاديين. وعلى العموم اذا اردنا ان نعيد قراءة المرحلة فإن الذي نفذ المجزرة أيضاً هو بشير الجميل الذي كان يصرّ في كل مناسبة على ضرورة إخراج الفلسطينيين من البلاد ليس فقط بقواتهم المسلحة بل كل الفلسطينيين، وعملية "الشرارة" لتطهير المخيمات كان متفقا عليها مع شارون ويغن قبل موت بشير نفسه، مع احترامي للجميع. اما بالنسبة الى الفيلم ومن موقعه الاسرائيلي فقد ادان في الصميم المشاركة الاسرائيلية في المجزرة بل وحّملها بشكل رئيسي الى جيش الدفاع الاسرائيلي، كما أدان غزو 1982، ولا يمكننا ان نطلب المزيد منه فليس هذا شأننا. يعني لا يمكن أن نطلب من الفيلم أن يعلن بياناً واضحاً أنه ضد الصهيونية ععقيدة رسمية لدولة إسرائيل.